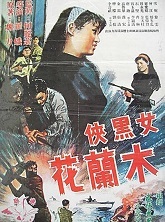 Suet Nei stars as the "Black Musketeer", a lovely female jewel thief/secret agent, in the first film of the Dark Heroine series. With the help of her younger sister (Law Oi-Seung), she steals from the rich and powerful to give to the poor. Also stars Kenneth Tsang Kong. Also with Yung Yuk-Yi, Sek Kin and Tang Ti. (In Cantonese language).